Raffles Place, Singapore – Nami Corporation announced that Nami Crypto (NAC) has been listed on the Exrates.me from 24.03.2018. This is a milestone marking the progress of NAC in particular and the entire Nami ecosystem in general. Investors who are interested in NAC can now easily exchange, trade, maximize profits with NAC. Exrates.me is a cryptocurrency exchange platform with a commitment to low transaction fees, high security, excellent user experience and 24/7 online support. With daily trading volume of more than 12 million USD, Exrate.me attracts more than 600,000 visitors in February 2018 from Indonesia, USA, Vietnam, and Russia. Exrate.me is suitable for both beginners and experienced investors with app versions now available on iOS and Android. By just knowing the users nicknames, investors can easily exchange money on Exrates.me. Exrates.me is now available in English, Russian, Chinese, Indonesian, Arabic and allows funding/withdrawal by a wide range of Fiat currencies such as USD, TRY, EAD, VND, . Beside Bitcoin y, other potential cryptos such as EDRCoin, NAC, etc. are also listed. Nami Crypto (NAC) is a token of Nami ecosystem, which liquidates transactions on nami.trade, nami.bo, and other platform on Nami ecosystem.. NAC will act as the trading currency for transactions in EURUSD, GBPJPY, GOLD, OIL, S&P500, DAX, BTCUSD, ETHUSD, BTCETH, NACUSD, BTCNAC, XRPUSD, XRPNAC, and more than 3,000 other instruments. 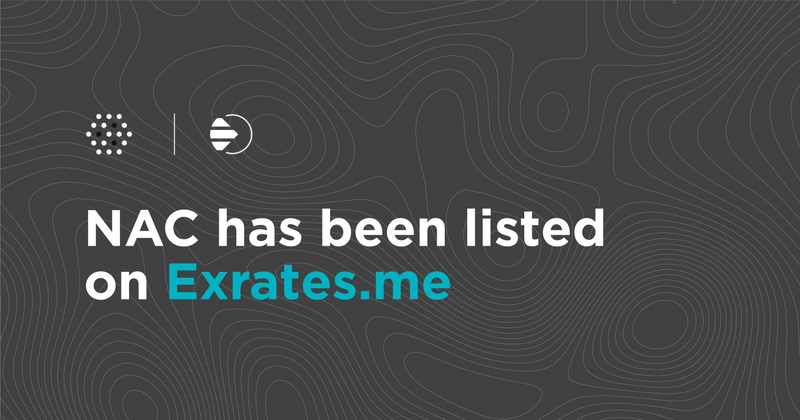 NAC has been listed on Exrates.me, now you can take the opportunity to maximize your profits. Register here to activate your transaction on Exrates.me.